Hot on the heels of The Flash #135 came Green Lantern #20 in that summer (the books were always dated a couple of months ahead of actual publication so trust me when I say that this was in the summer) of 1963 featuring a guest appearance by The Flash. 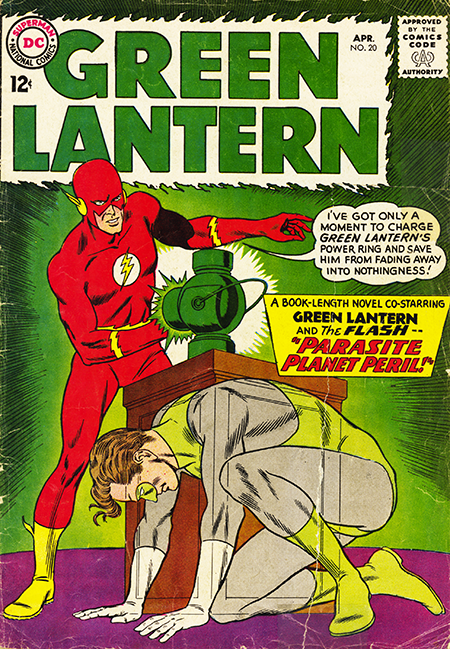 This wasn’t a crossover between both of the books, just a one-way visit by The Flash to GL’s home Coast City. Sadly, I missed coming across this issue on the stands back then which is too bad because it’s nice SF romp and perfect summer reading fare. The pretext for Flash’s visit is an outbreak of the vanishing plague which has been making Coast City denizens disappear. One of the first signs of the problem is a paleness that starts showing up on the victim, and, as the two heroes are working to solve this mystery, the Flash notices that GL is looking a tad meeked. Just before he disappears GL gives his ring to the Flash to hold while he tries to recharge it. The Flash vows (he actually says “I vow”) to find GL wherever his is. The scene shifts to the land of the Mikrids where we see GL in a high tech pen with other humans. We learn that the Mikrids are tapping the brain power of the humans to power their high tech world leaving behind in their victims a human who is a Republican a brainless, uncaring, soulless husk devoid of all humanity. Luckily the Flash shows up just in time to keep GL from a fate worse than death and the two heroes begin mopping up the Mikrids. However, when they reach the command post of the Mikrid leaders they find that Iris West and Carol Ferris, our guys in a relationship with gals, have been captured by the villains and will be destroyed by a devastator machine if the Flash or Green Lantern use their powers. So our heroes lay off the powers and simply slug their way to the devastator machine destroying it, which then leaves them free to mop up the Mikrids with their powers thus saving their girlfriends and humanity all in one shot. Like I said, a nice summery bit of business to tide one over until the happy day when The Flash #136 would show up in the mailbox.